Kogenta was betrayed twice by the humans he trusted. First, abandoned to the streets, then killed for the entertainment of cruel people. But because of him, good people came forward to protect the animals who depend on us. Japan had hardly any laws to protect animals from cruelty and neglect. But now people are saying "We can't allow this!" And they are fighting to improve the law, and to teach people all over the world that life is precious. Laws alone can't stop abuse, only respect for life can. who have no name or picture to remember them by. 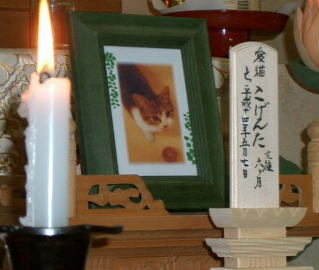 Because of Kogenta, who died with no friends, but now has friends all over the world, many other animals will be spared. To learn more about Kogenta, and the effort to stop animal abuse and cruelty, visit "Dear Kogenta".